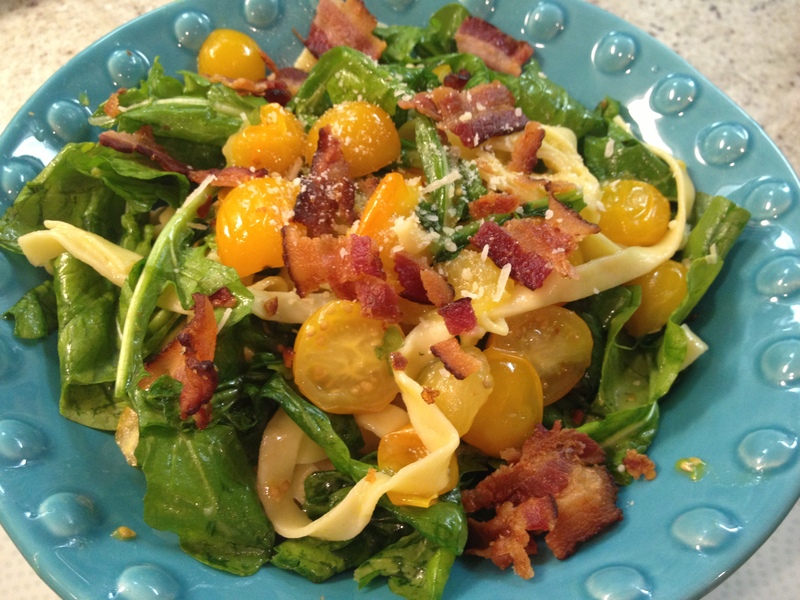 Spring Pasta Dish: Linguine with Arugula, Tear Drop Tomatoes and Bacon … mmm, Bacon! In Southern California, we have two seasons: Spring & Summer. They are almost indecipherable & you will hear me start to really complain about the heat come September. Well, it’s only April and already 80 degrees! When it gets hot, I don’t want to be slaving over the stove or messing around in the oven. I want something light, easy and (of course) delish to eat for dinner. And we’ve established (via the brussels sprouts post) that bacon makes everything awesome! And since The Husband’s work days are getting later and later, it has to be something that I can whip together & not too heavy because we’re eating at 8pm or so. This dish is in my rotation during the spring & summer months (aka March – November.) I short cut it by purchasing the refrigerated pasta, (you can use linguine, fettucini or paparedelle -which is tough to find around here, but it’s my favorite pasta for this dish.) And, depending on what tomatoes they have in the store, I use yellow tear drops, grape tomatoes or both! Cook pasta according to package directions. Drain; keep warm.